Here comes the successor to GT-190 (reviewed here), the good Cinitq Alternative that I complimented back in the day, but this time with a 1080P resolution on the 19.5 panel, higher pressure sensitivity, which is not an important feature, but is very nice to have. The stand allows you to tilt Huion KAMVAS GT-191 from 20° to 80°. It’s a sturdy stand. If you used any similar pen display to this one, then you know what to expect here. Since Huion KAMVAS GT-191 supports VESA mount, you can mount it to an Ergotron arm or any similar mount. Since you use this pen display for drawing, having an arm attached to it can make drawing with it very convenient, both to rotate the display to draw certain lines, or to draw while sitting down & standing up. This pen display support various display ports, like HDMI, VGA & DVI ports, making it compatible with many computers out there. Even if your computer supports Displayport or mini Displayport, you can still connect it to your computer using an adapter. The placement of the cables at the bottom of Huion KAMVAS GT-191 means they will get squashed when you adjust the stand to a low angle. Huion KAMVAS GT-191 is not without an issue, as you may need to adjust the colors to satisfactory level. There is a parallax issue, which won’t stop you from using it to produce great artwork, but you better know about it beforehand. The price for Huion KAMVAS GT-191 is one of the things that makes it an attractive option, as it’s chapter than any of the modern Cintiq models. This is the main selling point of this Cintiq alternative. Note:- This review will be updated the more I use the Kamvas in actual projects, since there are things that only appears later after some time of use. Supports VESA mount:- Until last year, I wouldn’t support this as a pro really, but now that Wacom made it harder to mount a VESA mount for their latest Cinitq Pro 24 & 32. You may be looking for an alternative that supports that mount. The screen size you get is good for the price, specially comparing to the Cintiq models in the same price range. Has a possible issue where you may need to recalibrate the pen every now & then. Has no hot keys at all, but it’s okay if you use the keyboard for shortcuts. The screen protector that comes attached to it can be annoying, but fortunately, that protector can be removed. The colors you get out of the box may require you to calibrate the monitor. Has 8192 Levels of pressure sensitivity. Screen Aspect Ratio:-16: 9 ratio. 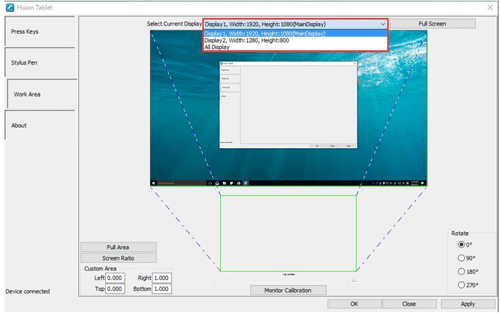 Screen Resolution:- 1920 x 1080, also known as HD. 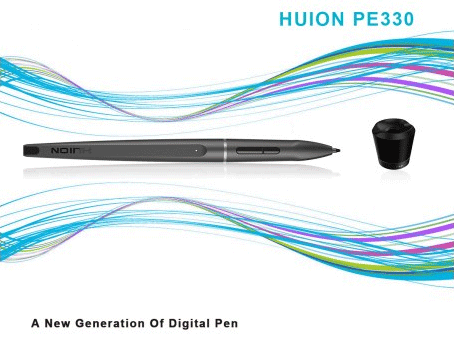 New Pen PE330 that supports the new 8192 pen pressure levels. 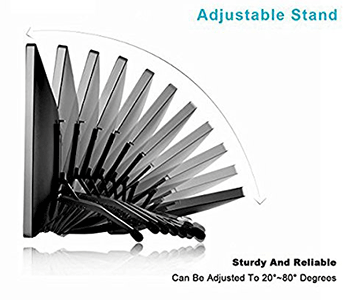 Has an Adjustable Stand that can be adjusted from 20° to 80°. Compatible with Windows 7, Windows 8, Windows 8.1, Windows 10. As well as compatible with Mac OS X 10.11 or above. 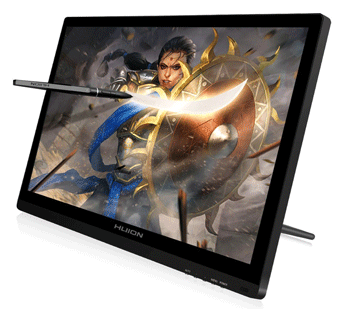 Huion KAMVAS GT-191 offers a screen size of 19.5 Inch, with a resolution of 1920 x 1080, which is also known as HD, if you’re a user of a smaller pen display, like the Cintiq 13HD (reviewed here), then you will appreciate the additional screen size here. The screen panel is IPS which mean colors stay the same even when you look at the screen from another angle, that’s useful for drawing & painting. I personally wouldn’t advise to work on any other type of monitors (it’s possible, but why not use the best panel out there?). Huion KAMVAS GT-191 supports 3 types of display ports:- HDMI, VGA & DVI, making it possible to connect it to probably any computer. 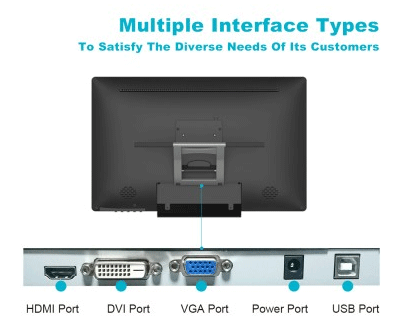 Even a computer with a Displayport or mini Display port can be converted to any of the 3 ports. That’s better than the Cintiq Pro 13 & 16, which only supports USB-C or mini Displayport out of the box. You connect the power adapter to Huion KAMVAS GT-191 from one side, and to the wall on the other. You connect the USB cable to Huion KAMVAS GT-191 from one side, and then to your computer. You connect the HDMI/VGA/DVI to Huion KAMVAS GT-191, and then to your computer as well. At the bottom of Huion KAMVAS GT-191, there are OSD buttons to adjust the screen settings, just like any computer monitor. Out of the box, you may not get the best colors from Huion KAMVAS GT-191 with default settings. In that case, you will need to re-calibrate the colors, which is not a hard thing to do. Just choose the “User” preset from the OSD menu, and adjust the colors, I was able to calibrate it by eye to match my other screens a little bit. I never tried it, but I bet using some sort of screen calibrator to calibrate the screen can make your life much easier. Speaking of screens, I had no issue using Huion KAMVAS GT-191 with 3 monitors setup (including the Huion itself). The driver crashes for me periodically, but I can restart it within minutes. It’s still very annoying. 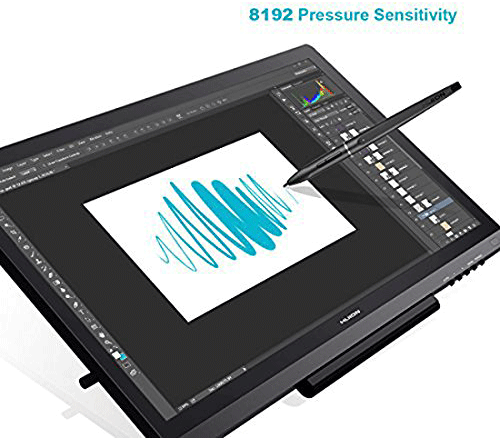 Huion KAMVAS GT-191 supports 8192 level of pressure, I expected to have that much pressure in a Huion product, since Wacom competitors follow suit whenever Wacom does something. While that’s nice to have that much pressure, I wouldn’t recommend Huion KAMVAS GT-191 or any pen display to anyone just because of this pressure level. It’s just a bonus to the other features of this pen display. I totally believe that we already have enough pressure level for our artists needs, maybe in the long term we will need more than 8000 levels, but I don’t see that happening anytime soon. I said similar things in my reviews of Wacom products with similar pressure levels, like all Cintiq Pro models, as well as Intuos Pro 2018. You need to press a bit more to register stroke on Huion KAMVAS GT-191 compared to Wacom. Since I am used to drawing with the latter, I had to change the pressure sensitivity in the driver to be close to what I like. This is not something you can’t get used to. Despite the fact it has the same pressure levels as Wacom’s latest Cintiq offerings, Huion KAMVAS GT-191’s screen Still uses HD resolution. I won’t say this is a bad thing, this resolution is totally usable, and it’s higher than what we used to get from most Cintiq alternatives. it’s a resolution where icons can have a good size too, as icons can appear smaller on 4K resolution, unless your drawing software is updated to suit that resolution. Some artists would prefer higher resolution for drawing though. I totally expect to see a 4K Cintiq Alternative from Huion & other Wacom competitors in a matter of time. There’s some parallax you will feel while drawing, but it’s not something you can’t get used to, but it’s generally worse than what you get with Wacom Cintiq. In case you’re not familiar with parallax, it’s an offset between the cursor & the pen tip. The thicker the screen glass, the more parallax is. Calibrating your pen ensures you get less parallax, but it will still be there. It’s also recommended to calibrate the pen when you change your sitting posture, it’s recommended you calibrate the pen again. In my case, calibrating the pen will make the match the cursor when I hold the pen the exact same way I did when I calibrate it, especially on the screen area I am directly facing. Changing my hand posture, something I do at times when I draw certain lines, or drawing in the areas away from me make parallax appear. It felt a little similar to the way Cintiq Pro 16 did (which I used to own in the past). There’s an attached screen protector on the top of Huion KAMVAS GT-191, the purpose of that is to add some friction with the pen, which makes drawing with Huion KAMVAS GT-191 closer to drawing on paper. Many pen displays & graphics tablets do something of that sort. There’s a good chance you won’t like that protector & end up removing it. It’s a matter of preference. Huion KAMVAS GT-191 has no express keys on the top of it, that’s not an issue if you’re the kind that uses keyboard shortcut to do all sorts of stuff while you draw. I don’t deny that I miss the touch ring and the ability to quickly switch between different tools, but I am able to draw very well despite that. Huion KAMVAS GT-191 support a new pen, which has model number PE330. This pen is made to support the higher pressure sensitivity of this pen display. The pen needs to be charged via the port at the other end of it. The pen battery lasts for a long time, so it’s not something you will need to charge often, like your mobile or anything. Also, the pen blinks out when battery is low, so you will know in advance that you need to charge it. Because you plug the charging cable at the back to charge it, there’s no eraser at the back of it. Along with the pen, You get 8 spare nibs. Pen nibs tend to wear off when you draw with them for some time, so they need to be replaced once they become pointy, or else you may end up scratching the screen. Since the screen is glassy, this is less of an issue here. Generally speaking, the amount of time each nib lasts depends mainly on the screen surface, and how much you press with the pen while you draw. You can always buy more nibs when the need arises to. I have discussed how much pen nibs last in more details in this post right here. Note:- The unit I own came with a small bag containing 10 more nibs. Sometimes companies like Huion add gifts with certain packages, and it looks like the extra nibs was added as so. Just like the case with all the graphics tablets & pen displays I reviewed, the pen comes with a stand to place your pen on. The stand also doubles as a nibs remover tool. Another standard feature of Huion KAMVAS GT-191 is the two buttons on the side of it, which you can customize from the driver interface. If you have any of other Huion products, it’s worth noting that the new pen not compatible with many other Huion devices. Huion gives you another gift pen, so you could use one & charge one, and to have a spare in case you lost one of them, which is more common than you think (Twitter is full of artists tweeting how they lost their Wacom pens). I lost mine many times. The pen doesn’t support tilt sensitivity, which is a nice feature, but it’s less used than pressure. Most artists, and particularly new ones, don’t need to use it (The best way to know is to try it out yourself and see if you actually need it). I personally don’t miss the tilt sensitivity from my Wacom, as I almost never used it to create my own artworks. Huion KAMVAS GT-191’s driver allows you with various options, calibrating the pen to mapping the drawing area between different screens, this is important since by default, the drawing area was mapped to a different screen, which different from the Huion’s. The driver is also where you can customize the pen buttons. It also provides you with a way to test pressure to see if it’s working. You can also rotate the working area, this can be useful in case you want to rotate your Huion KAMVAS GT-191, especially if you attached it to an Ergotron arm. One of the nicer options out there is the ability to adjust the pressure curve. This determines how different amounts of pressure you apply is translated to your drawing program. This can make it easier to draw once you find the settings that suit your ways. Drawing with the default settings is okay when you first get started. You can disable Windows Ink from the driver, something you may need to disable if you got issues with Windows 10. Huion pen displays, and all the similar Chinese drawing devices, are known for their sturdy stand. While the stand they come with is really simple, it’s way better & more useful than the legs we see on newer Cintiq models. The Stand can be adjusted from 20° to 80°, which is more than enough for many artists. The stand comes separately, and you install it using the 4 screws that come in the box. One thing I would complain about here is the way the ports are placed at the bottom of Huion KAMVAS GT-191, as they cause the cables to get squished when you adjust your Huion KAMVAS GT-191 to a low angle. This is an issue I found in similar products too. Using thinner cables can alleviate that problem though. If the stand isn’t enough for you, Huion KAMVAS GT-191 supports VESA mount as well, where you can attach an Ergotron arm & similar product. As Huion KAMVAS GT-191 weights around 13 lb, you won’t have to worry much weather the arm can support it or not. Using an arm gives you a lot of flexibility, like the ability to rotate your Huion KAMVAS GT-191 or work while standing up. VESA mount is something Wacom seems to be ditching with their latest Cintiq Pro 24, and the bigger Cintiq Pro 32 models. I sincerely hope that Huion & all the other makers of pen displays to keep supporting VESA mount, as it’s something artists actually want. While Wacom issues with drivers & the like is one of the reasons some artists go for Huion & other competitors (the price is another reason). The thing is, even Wacom competitors have their driver issues, so getting them may not guarantee you will have a perfect experience. Still, you may end up having better luck with the alternatives, which makes them worth the shot. I won’t get to the issues where Huion KAMVAS GT-191’s driver conflicts with any installed Wacom driver. It’s always advisable to remove any Wacom driver you have installed on your computer. I always recommended that with every review of Wacom competitors products. One of Huion KAMVAS GT-191’s issue is where you have to recalibrate the pen every now & then. This can be annoying, I hope this issue gets resolved in the future. To get around some of these problems, you may need to try different versions of the drivers. I usually recommend using the latest driver from the website, but even that could fail at times. Unlike Wacom, which gives you the option of downloading many versions of their drivers. In the case of Huion products, you get to download the latest 4 or 5 driver version, and you could also try the one you get in the CD. I tried the latest driver on their site, but it failed to detect my Kamvas. 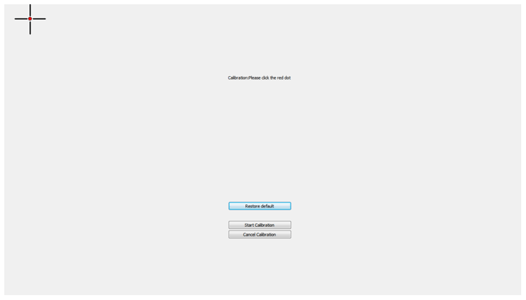 I tried another version from the same site, and it worked relatively well (besides some crashing from time to time). I plan to try another version later on. I will update this review to reflect on that. Whether you want to move away from Wacom driver issues, or simply want an affordable Cintiq Alternative, Huion KAMVAS GT-191 is a good device to consider here. You won’t have to worry about comparing this to Cintiq if you never used it. It works with many drawing applications too, so you won’t have to worry about that too. Generally speaking, Wacom Cintiq alternative tend to be hit or miss, but their lower price makes them worthy of the risk of trying them, since they worked well with many people before. Just thought I’d let you know. Again, thanks for the review.